PARSS can help your small or rural school district make the connections and take the steps to bring about change benefitting your students and community. Here we share a few exciting success stories about what our members have accomplished. What do the following tasks have in common? Build and explain a device that can levitate small objects using only sound waves. Explain why some materials when ground to fine powder change colors and build an experiment that proves the theory. Build a looping pendulum and create a mathematical model that predicts the motion of the system. Answer: They are research questions investigated by Octorara students as part of the school district’s participation in the International Youth Physicist Tournament (IYPT). IYPT is an international event that publishes a series of physics related research questions that do not currently have published answers. Students complete hundreds of hours of research on these problems, eventually preparing to debate other schools from around the world about specific solutions proposed to the problems. The research is interesting and challenging with many of the solutions published by student researchers in science journals. Octorara has won the national championship three years in a row. As a result, the school district has sent students on to compete at the international level in Singapore and Beijing. This year’s team, which includes students from Octorara, Phoenixville, and Coatesville, will represent the United States in Poland. The Chester County Intermediate Unit secures grant funding and supports the travel arrangements for the team. Dr. William McWatters and Mr. Matthew Livingood, Octorara science teachers, mentor and coach Octorara’s students. Students involved in Octorara’s IYPT program have gone on to study many science related disciplines including physics, neuroscience, engineering, pre-medicine, and chemistry. 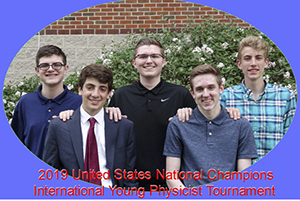 Each has credited the experience of the International Youth Physicist Tournament as providing the strong research experience needed to be college and career ready. 2019 USA IYPT Team Members: Octorara students: Kyle Quinn, Ethan Whitney, and Ryan Baggett. Phoenixville student: Colin Murphy; Coatesville student: Ryan Michael Martin LaRue. We invite you to watch this video clip demonstrating how the Early Childhood Learning Center in the Titusville Area School District is making an impact. There was a lot of buzz in the Wyalusing Valley High School (WVHS) auditorium last Thursday afternoon, Aug. 24, as teachers, administrators and board members anxiously awaited the arrival of the “special guest” whom they had been promised would pay a visit. Be sure to read the full story from the Rocket-Courier. On May 19, 2017, the Northeast Bradford School District STEM team comprised of Evan Brown, Adam Cole, Morgan Fries, Marcos Biesa, and Jenna Saxe placed in the top six out of the twenty-four teams that participated in the Governor’s Science, Technology, Engineering, and Math (STEM) Competition at Thaddeus Stevens College of Technology in Lancaster. The STEM Competition includes teams from around the state that qualified for the competition by winning their regional event last winter. Northeast Bradford, in their first year, won their regional competition with their project “Geothermal Roadways,” which utilizes the Earth’s heat by maintaining constant road temperatures (warm in the winter and cool in the summer). The team worked closely with PENNDOT to learn more about safe driving conditions and costs. This year, 186 teams made up of approximately 700 students from 28 intermediate units participated in the regional competitions. 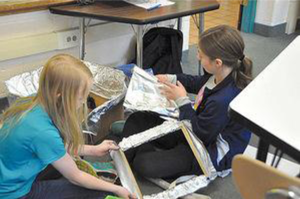 Teams began designing and building their projects in November and were able to make improvements after the regional competition. After the regional competition, the Northeast Bradford team added bridges to their geothermal project as well as including solar power back up for days when the temperature was too cold for the geothermal process to keep the roadways warm enough. 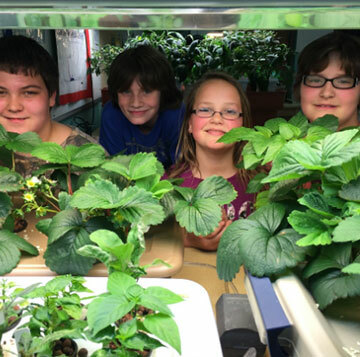 On June 21, Southern Tioga School District will join the PA School Study Council and Penn State University’s Curriculum and Instruction Team at the STEM 2.0 Workshop, where the workshop will feature Blossburg Elementary in the Showcase of Schools for their hydroponics program. 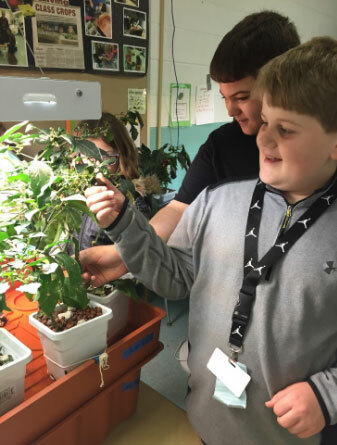 As a fresh and innovative approach to teaching plant growth and development in their curriculum, the Blossburg Elementary team chose to introduce hydroponics last year as a project-based learning unit to increase student engagement. 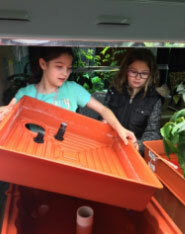 This hydroponics project has now evolved into a transdisciplinary STEM approach to learning in that fourth and fifth grade students have taken an active role in improving the world in which they live. Growing plants while utilizing hydroponic techniques has enabled Blossburg Elementary students to not only observe, but to also manipulate plant growth, development, and reproduction. The school has transformed a once-empty classroom into the grow room, which continues to serve as a launch pad for understanding and investigating eco-friendly, sustainable, and renewable sources of food production. The students are at the forefront of an emerging technology in food crop production, and they are excited to share how they are pioneering and growing the movement from seed to market at Blossburg Elementary School. Jeannie Herres, elementary science teacher; Jeanne Carlson, elementary English language arts teacher; Jeff Manikowski, elementary math teacher; and Jesse Maine, director of curriculum, instruction, and assessment, will represent the district as part of the panel discussion at the Nittany Lion Inn in State College. Do you remember when you were young, sitting in an elementary classroom for hours while the teacher lectured on and on… those days are long gone! Any teacher today can tell you the benefits of keeping students engaged and active. It makes learning more fun and reduces classroom disruptions. Recently, our school is taking this movement in the classroom to another level. The Adverse Childhood Experiences (ACE) study has been stimulating conversations about trauma more and more in communities and in our schools. The study basically looks at how childhood trauma affects a person’s life. The results showed that the more trauma, the higher the risk for risky health behaviors, chronic health conditions, low life potential, and even early death. The ACE study has led to efforts to combat these odds. Most interesting is the research that can actually measure brain activity and growth. When a person receives treatment, combined with trauma-informed techniques, the risks associated with childhood trauma go down. This is the reason that Conneaut Valley Elementary School has teamed up with its parents to provide an environment that will be a safe place for children who experience trauma. Being trauma-informed changes the way we view children’s behaviors. Instead of judging a child saying: “What is wrong with you?” we assume a new view: “What happened to you?” Just shifting this thinking and being aware of how childhood trauma can manifest is a step that the whole Conneaut School District has taken. Many people have heard of the “fight or flight” response: the brain releases chemicals when we are frightened, threatened, or when we witness events that are traumatizing. This is what can change the brain. Thinking, learning, and processing shut down. The heart rate goes up, breathing speeds up, and survival becomes the body’s goal. This makes learning and self-regulation very difficult to the child in school. The body can re-absorb these chemicals naturally, but exercise, mindfulness, yoga, and being able to stand and move speeds up the process, according to recent studies. This is why we are rolling out new approaches to the classroom that make it ok to stand, pedal, bounce, and swing, all while learning. Students at CVES will have access to “movement makers” that we are purchasing through a grant through Crawford County Human Services. Most rooms will have pods of desks sitting on bed risers, making them the perfect height for standing. Stationary bike pedals will be available to either put under a student’s desk or place in front of any chair to give students an opportunity to keep moving during the day. We have also ordered ball seats to give students the ability to sit and gently bounce, wiggle, or wobble at desks or tables. Finally, craftiest of all, we are installing PVC swings on desks so that children can gently swing their legs to and fro while they sit. If all of this sounds like fun, you’re right! It’s true, your kids do have things better than you did in school. First computers and now this. We are giving kids the ability to move, stand, and wiggle, all while learning. There is proof that these techniques help reverse the negative effects of childhood trauma, so how could we say no? Parents who have heard of the ACE study are on board with anything that can help their children process and cope, and these “movement makers” are just one thing that we are providing our students at Conneaut Valley Elementary School to embrace this trauma-informed way of thinking. 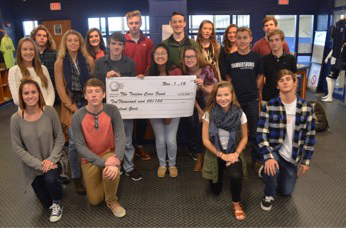 Proceeds from the sale of merchandise in the Chambersburg area senior high school's student store resulted in a $10,000 contribution to the Trojan Care Fund. The Trojan Care fund helps any student in the district who experiences a life-changing event such as a house fire or severe car accident. 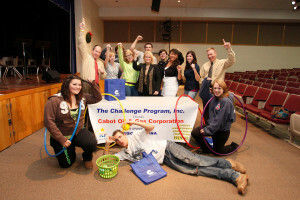 Please read more about the Trojan Care Fund in a Chambersburg Area School District press release. In an effort to help expand access to scholarships to students pursuing higher education, Raise.me provides a valuable and no-cost opportunity to offset tuition costs at major colleges and universities across the nation. On Thursday, Appalachia Intermediate Unit 8 (IU8) hosted an educational forum at Toftrees Golf Resort to introduce the Raise.me initiative that enables students in grades 9-12 to earn scholarships throughout high school for things like getting good grades, volunteering in the community, or joining extracurricular activities. Joining the event and providing his perspective on federal education policy was Congressman Glenn ‘GT’ Thompson (PA-5). IU8 has stepped up to promote this initiative to high schools across Pennsylvania to help expand access to scholarships so that more students have the opportunity to pursue higher education. Penn State, Carnegie Mellon, and more than 180 other college partners are already working with Raise.me to provide scholarships. Congressman Thompson presented Aubree Brancato, a 2016 graduate of Rockwood Area High School, with a Congressional Award for her participation in the Raise.me program. Aubree earned over $8,000 in scholarship funds by participating in the program. Aubree is continuing her education at Penn State Altoona, where she is majoring in nursing. Rockwood Superintendent Mark Bower introduced Aubree at the ceremony. He shared “it was a true honor to be able to recognize such an outstanding young lady for the award.” Rockwood is one of several schools throughout the state participating in a pilot program with Penn State to award scholarships to students from rural school districts. Bower praised the program for focusing students early in high school towards preparing themselves for success at the college level. “We are extremely proud of our students who put so much effort into achieving good grades, volunteering, and participating in activities outside of the classroom. It’s wonderful they now have a streamlined way to earn scholarships through the Raise.me Initiative,” added Dr. Butler, executive director of IU8. Students and parents interested in learning more about the Raise.me initiative should visit their website. IU8 was created to furnish a broad range of educational services to the 35 public school districts, five area vocational-technical schools, two charter schools, and approximately 81 non-public schools in Bedford, Blair, Cambria, and Somerset counties in west, central, and southwestern Pennsylvania—serving approximately 55,000 students in an area covering 3,500 square miles. Our services include professional learning, administrator resources, student courses, and many more activities and events! Learn more at the AIU8 website. 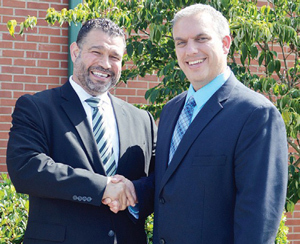 Learn how Susquehanna County Career & Tech Center (SCCTC) in the Elk Lake School District created a mutually beneficial partnership with Cabot Oil & Gas Corporation. The recognition of the partnership before a Senate Briefing Committee in Washington, D.C., by SCCTC Executive Director, Dr. Alice M. Davis. Students at Halifax High School are learning business management by doing, becoming college and career ready for business related occupations through course offerings in the district’s new Wildcat Business Academy. Using Pennsylvania’s career and technical education program of study for Accounting as the foundation for its curriculum, the Wildcat Business Academy affords students the opportunity to major in business during their junior and senior years of high school. Course offerings include two levels of Accounting, Introduction to Business, Entrepreneurship, Technical Writing, Business Law, Marketing, and Microsoft Office Applications. Students are further encouraged to apply skills learned in the classroom by pursuing internship and cooperative education opportunities with local businesses. College credit is also available by completing the National Occupational Career and Technical Institute exam during the senior year. A critical component of the Wildcat Business Academy’s curriculum is a school store called “The Den.” A student run enterprise sponsored in part by Mid Penn Bank of Harrisburg, it affords students an opportunity to learn all aspects of managing a business by actually managing a business. Students choose the merchandise, create the advertising, maintain the accounts, and serve the customers. Participation in the high school’s chapter of Future Business Leaders of America (FBLA) further challenges students to develop their potentials as leaders through service and workforce education activities. Workforce development data proves that business related jobs are high priority occupations that provide family sustaining wages and limitless opportunities for success. The Halifax Area School District is proud to support the Wildcat Business Academy, a program that ensures students are college and career ready as the future business leaders of Pennsylvania. 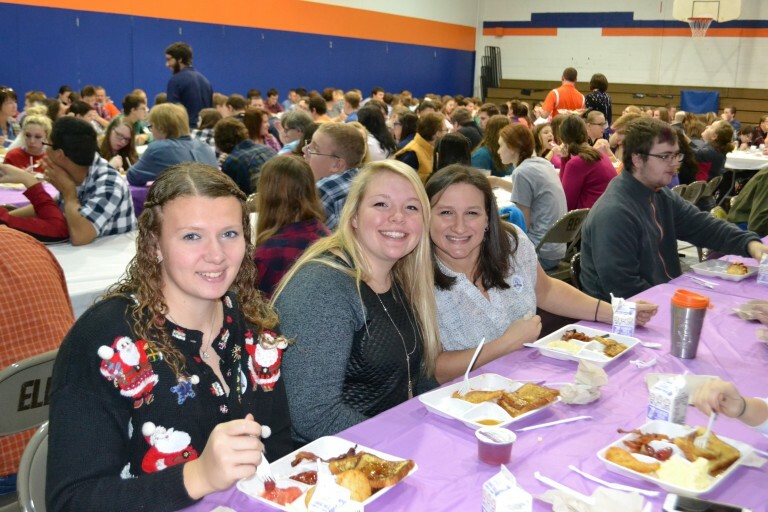 Kingsley, PA – On Thursday, December 3, 2015, faculty, staff, and students of the Mountain View School District celebrated the Family & Consumer Sciences Day—a national celebration that educates families about the importance of preparing healthy meals and “dining in” together. In an effort to encourage students and their families to prepare and eat a healthy meal together at home, 1,043 students, staff, and faculty of the Mountain View School District in both the high school and the elementary school buildings shared a home-style breakfast together. Students in the Foods I class, along with Elaine M. Chichura, D.Ed., Family and Consumer Sciences teacher; Robert Presley and Christine Kelly, high school and elementary school principals, respectively; Erin Oakley, Food Service Director; Diana Slick, counselor for at-risk elementary students; and Pete Regeski, high school librarian, planned this district-wide breakfast. In addition to sharing breakfast in school, individuals were encouraged to join in a national campaign sponsored by the American Association of Family and Consumer Sciences (AAFCS). Individuals showed their support for the “Dining In” campaign by committing to “Dining In” on the AAFCS website. Their commitment to the project appeared on an interactive map on the web site. In total, 656 individuals living within the Mountain View School District joined the more than 127,270 people worldwide in committing to preparing and eating a healthy meal with their families on December 3rd. The American Association of Family and Consumer Sciences has plans to feature the Mountain View School District family breakfast project in an upcoming campaign to encourage more families to share healthy meals together. With the numerous benefits to families preparing and sharing meals together, “Dining In” in school or at home calls attention to something simple that families can do to be healthier. “We are proud to take part in this important initiative,” Chichura said. December 3rd was chosen as Family & Consumer Sciences Day to honor AAFCS Founder Ellen Swallow Richards, the first female graduate of MIT. Inside a Conneaut Area Senior High classroom with a handwritten sign on the door last week, three young women sat at a table stacked high with textbooks, gazing into the laptop screens before them. Please read the news story in its entirety on The Meadville Tribune website. "Imagine a classroom setting where all students, despite age differences, are confident in themselves and excited to learn. Where students are not confined to categorization by class or academic achievement, but move at their own pace to improve upon skills that they need." This is just the beginning of another success story from Hydetown. We invite you to read the news story from May 10, 2017, in its entirety from The Titusville Herald website. We invite you to watch this video clip demonstrating how Schuylkill Haven translates learning in the real world. We invite you to watch this video clip demonstrating how student achievement is non-negotiable in the Halifax school district. We invite you to watch these video clips demonstrating kindergarten small groups for focused learning and getting students ready to learn in the Bellefonte Area School District. It is an honor only 342 schools across the country can claim. And one of those honorees is in Greenville. The students, teachers, and administrators at Greenville Junior/Senior High School were officially allowed to announce the secret Thursday — their school is a National Blue Ribbon School. The official description of the honor they received is this: The National Blue Ribbon Schools Program recognizes public and private elementary, middle, and high schools based on their overall academic excellence or their progress in closing achievement gaps among student subgroups. But, it is much more than just that. The award honors those schools — public, private, and parochial — that go above and beyond to make learning interesting, inclusive and successful. They try new lesson plans and programs, challenge students to strive for even more knowledge and model just how much education matters. They reward student success and support those who are struggling. And, they instill a love of learning that students will take with them throughout their lives. The work begins with not only good lessons in the classroom, but also with the support of parents and the community. But, even all that does not make a Blue Ribbon School. 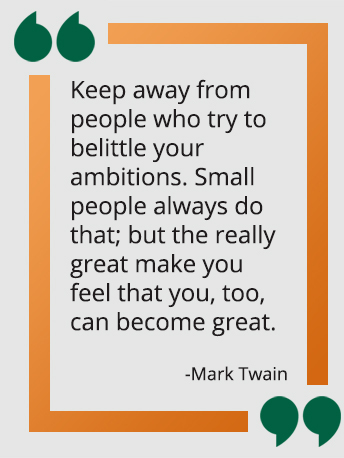 The students at Greenville Junior/Senior High are the ones who made it happen. If they had not worked hard, taken learning seriously, and achieved when the chips were down, there would be another name on that list. They should be proud of what they have accomplished. The secret to improving American schools is thinking out of the box. The traditional models, the traditional textbooks are not doing the job. We need innovation. We need standards. We need higher expectations. And, most importantly, we need to learn from those who are doing education right. And that is what we have in Greenville — a model of what is being done right. Congratulations to everyone who worked so hard to earn that blue ribbon. Fly the flag proudly.